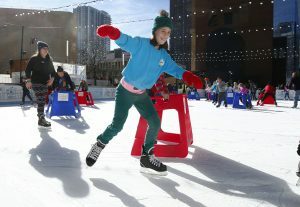 Celebration planned for Nov. 20 at 10:00 a.m.
DENVER (November 16, 2018) – The Downtown Denver Partnership is proud to bring to the community the ninth season of the Downtown Denver Rink at Skyline Park presented by Capital One, open daily for free skating Nov. 20, 2018 through Feb. 3, 2019. A Winter in the City staple in Skyline Park at 16th and Arapahoe Streets, the Downtown Denver Rink is a showcase of the Partnership’s commitment to bring fun, family-friendly activities to downtown’s parks and public spaces. The Rink supports strategies in the 2007 Downtown Area Plan, the long-term strategy for downtown, including activating Skyline Park as a central gathering place for the downtown community, as well as creating an outdoor downtown that provides residents, workers, and visitors to gather and play to foster a balance between urban life and the outdoors. The season opening celebration will feature a performance from Denver Figure Skating Club, and approximately 50 children from Denver’s recreation centers will be the first on the ice. Remarks from Sharon Alton, Denver City Council President Albus Brooks, Executive Director of Denver Parks and Recreation Happy Haynes, and Downtown Denver Partnership Chairman Mike Zoellner. “We know that the most sustainable way to build our economy is to create a place that attracts people and companies – and keeps them here – and vibrant parks and public spaces are a core component of that strategy,” said Alton. New in 2019 is the Capital One Destination Venture travel experience, Jan. 5-6, complete with a ski simulator, live art, special guests and more. Throughout season, skating is free, with skate rentals available for $6 for kids 12 and under and $8 for those 13 and over. 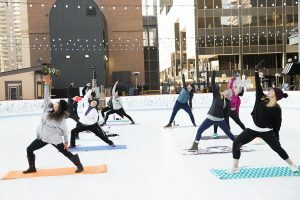 Special events are planned throughout the season, including: DJs on Friday nights, opportunities to skate with Santa, weekly snow yoga or “Snowga” presented by Yoga High, free skating lessons and more. Complete details on operating hours, special events, private parties and more are available at DowntownDenverRink.com. The Downtown Denver Rink at Skyline Park is produced in partnership with Denver Parks and Recreation and the Downtown Denver Business Improvement District.